Denomination : AE 16. 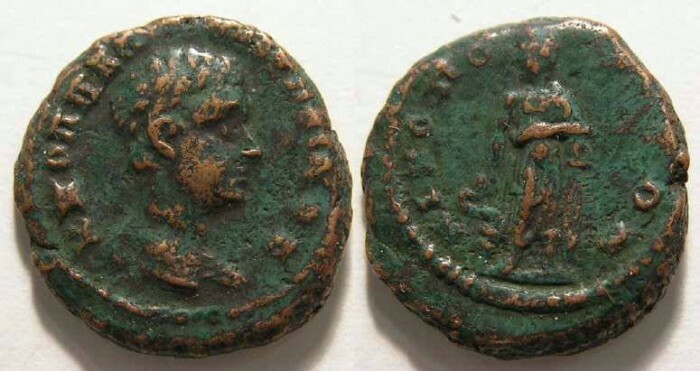 Mint : Nicopolis ad Istrum in Moesia Inferior. Size : 15.6 x 16.8 mm. Weight : 3.35 grams. Reference : I have not yet found a reference for this type. Grade : gVF with a trace of porosity. Obverse : Head of Diadumenian right, with Greek inscriptions naming him around. Reverse : Asklepios standing forward with head left, holding a serpent-straff, with an imscription naming Nicopolis around.